When the document is uploaded all associated users can download the original and when everyone signs - a signed document as well. When the document is signed, all associated users can download a signature validity confirmation sheet too. 1. Open a document you want to download from your document listing page. 3. The document format will be the same as the uploaded document. 4. Open a document you want to download from your document listing page. 5. Locate a section no. 4 called "Actions". 6. 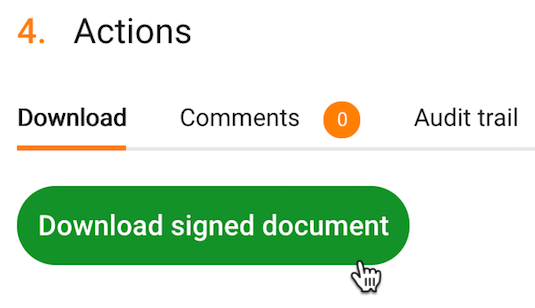 Once the document is signed, click on the "Download signed document" button. 7. The document format will be as defined in section no. 1 "Information", in the "Format" field. This format was chosen at the time of document upload. 8. Open a signed document from your document listing page. 9. Click the button "Confirmation sheet" that is located in the action bar at the top of the page. 10. Validity confirmation sheet will be opened in a separate window. 11. You can print or download signature validity confirmation sheet from this page. 12. In the document listing page, hover on the document you want to select to reveal a checkbox. 13. Click on the left side to select a document. 14. When at least one document is selected an action bar appears at the top of the page. Number on the left of the action bar indicates the amount of documents selected. 15. You can select documents manually or click the "Select all" button in the action bar to select all documents on that page. 16. To download the documents click the "Download" button and the ZIP file with all selected documents will be downloaded to your device. Note: always check whether the document signing status is as expected.